Max Muay Thai 3 in China. 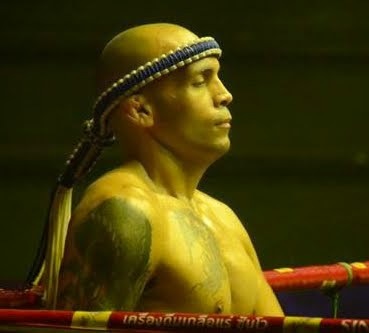 Kem SitSongPeeNong fought against Maiki Karathanasis. In this video, I highlighted Maiki's side steps, angles, and his "Dutch Style" knees/kicks. For Kem I highlighted his use of hand traps into elbows and how he dealt with Maiki's angles. No Cheerleaders were harmed in the making of this post. I enjoyed Maiki's punch-knee combos and use of angles, but Kem, the more experienced fighter with better understanding of the clinch, utilized hand traps and elbows. Maiki was on the brinks of a big upset as he knock down Kem in the 2nd round. Kem shook it off and applied forward pressure with his punch-elbow combinations that had Maiki MoonWalking around the ring. Both men fought to their best abilities but this was Kem's night. By Dutch style, commentator Rob Cox is referring to the vertical knees & kicks generally used by Dutch kickboxers. Since it travels less distance & at an upright angle, they are fast & less telegraphic to an opponents peripheral view. It's frequently thrown in close distance as a kick-knee hybrid. This rear hook that follows the low kick is typically thrown to ward off pressure fighters who push forward. Side step hook. You'll earn a split second advantage as your opponent must turn to face you. Maiki starts to work the outside angle of Kem's lead side. Stepping outside of your opponents lead can help you avoid his power power side. In clinch, if you're not off balancing or controlling your opponents hands, you'll leave yourself open for elbows. Maiki who is predominantly a kickboxer falls victim to Kem's elbow. Kem pressures Maiki towards the corner. Maiki's only option to escape the corner is to circle around Kem's power side. At the expense of a hard low kick. Kem attacks the center line with linear strikes. Kem controls Maiki's hand when near clinch distance, Catches the forward kick and welcomes Maiki with a lead elbow. Maiki lands a flush inside low kick. Kem long guards and drops his right hands in what looks like an attempt to counter but Maiki uses the rebound of his kicking leg and explode with a vertical knee. Maiki tries to keep Kem inside of his range, but must fight backwards since Kem is applying forward pressure. Maiki prevents linear punches by trapping Kem's hands & side stepping along the ropes towards Kem's lead side. Kem's solution? Answers back with a lead hook. Maiki throws a pulling overhand right in hopes to stutter Kem's balance into the path of a high knee. Kem regained his balance and since Maiki doesn't have both arms controlled, he's compensated with an elbow. Kem finds his range and attacks with punch-elbow combinations. Kem uses hand traps into elbows.